First Fedex, then Apple, then Delta, then Barnes and Noble, Macys, then American Airlines, then Alibaba, and now Goodyear Tire has just slashed guidance. supply constraints on volume for high-value-added consumer and commercial truck tires in the United States. The company also noted that while price/mix was positive during the fourth quarter of 2018, it was "less than anticipated due to weaker mix, partially as a result of the supply constraints referred to above." In addition, GT added that earnings fell in other tire-related businesses, including with respect to the Company’s U.S. chemical operations. As a result, Goodyear now expected 2018 net income to be "adversely affected" and the Company’s total segment operating income is expected to be "slightly below" the Company’s previous guidance of approximately $1.3 billion. The stock promptly tumbled after the warning, and has dragged down peers such as Cooper Tire. On January 15 and 16, 2019, representatives of The Goodyear Tire & Rubber Company (the “Company”) will present at conferences hosted in conjunction with the Detroit Auto Show and will provide an update on the Company’s preliminary 2018 performance. As part of those presentations, the Company will announce that fourth quarter of 2018 tire unit volumes declined by approximately 3% due to (1) continued weakening of the OE environment in China and India, (2) declines in the winter tire market in Europe late in the quarter, and (3) supply constraints on volume for high-value-added consumer and commercial truck tires in the United States. Price/mix was positive during the fourth quarter of 2018 but was less than anticipated due to weaker mix, partially as a result of the supply constraints referred to above. In addition, earnings fell in other tire-related businesses, including with respect to the Company’s U.S. chemical operations. As a result of these factors, for the full year of 2018, Goodyear net income is expected to be adversely affected and the Company’s total segment operating income is expected to be slightly below the Company’s previous guidance of approximately $1.3 billion. 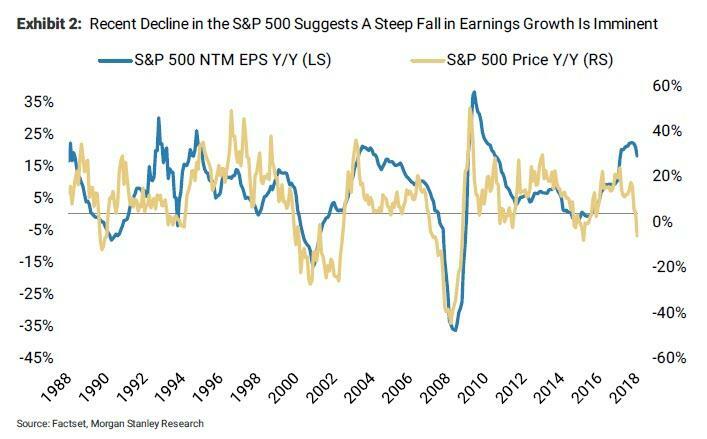 As we said recently, expect many more such guidance cuts as companies finally come clean with economic reality and with what Morgan Stanley said over the weekend, will soon be revealed as an earnings recession.